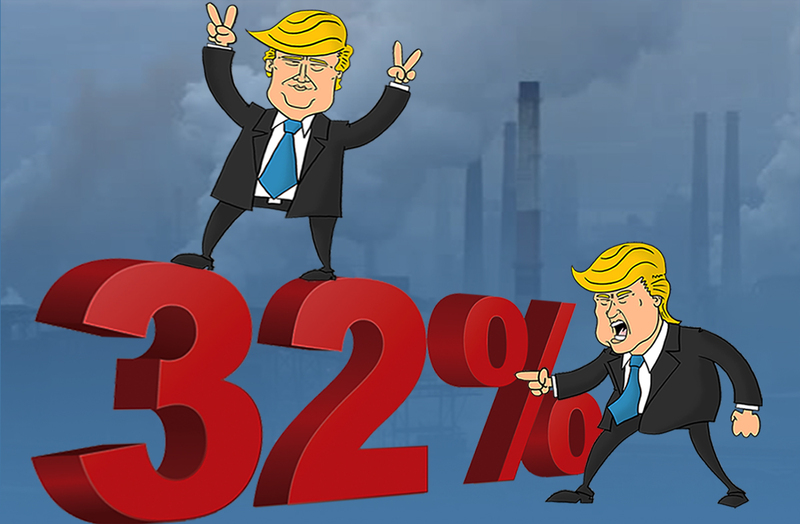 Number of the Month: 32% -- Trump vetoes Obama emission reduction; Trump approval nosedives. Trump Will Repeal Obama Plan to Reduce Emissions by 32%. Trump Approval Rating Hits New Low of 32%. On October 10, EPA Administrator Scott Pruitt announced he will reverse the Obama Clean Power Plan goal of reducing greenhouse gas emissions by 32%. First announced by President Obama in October 2015, the goal was not even an ambitious one. That 32% reduction was to be calculated based on 2005 emissions, not 2015 emissions, with a target date of 2030. Still, it was too aggressive for President Trump, who made the gutting of the Clean Power Plan a central plank of his campaign’s environmental platform. In anticipation, on the eve of the announcement, the Natural Resources Defense Council tweeted it will sue. .